WASHINGTON, D.C.– Today, the Employment Policies Institute (EPI) released, “Fighting $15? An Evaluation of the Evidence and a Case for Caution,” a nine-chapter book that examines the many consequences regarding a federally mandated $15 minimum wage. The book is accompanied by a policy briefthat highlights the book’s key takeaways. The book is complemented by EPI’s website FacesOf15.com, which tracks specific business closures following minimum wage increases. Download a copy of the full book here. Download a copy of the policy brief here. The book’s authors include labor economists, business leaders, and policy analysts; each with unique experience in the minimum wage debate. The book’s chapters cover all aspects of the debate over a $15 minimum wage, including the policy’s impact on the job market, on taxpayers, and on poverty rates. It also explores evidence-based alternatives to raising the minimum wage that are more effective at reducing poverty. There are better alternatives to raising the minimum wage: The book describes how the Earned Income Tax Credit has a proven track record of reducing poverty and has already created a more than $10 minimum wage for many single parents. Also discussed is research showing that the majority of minimum wage employees earn a raise within one year on the job. 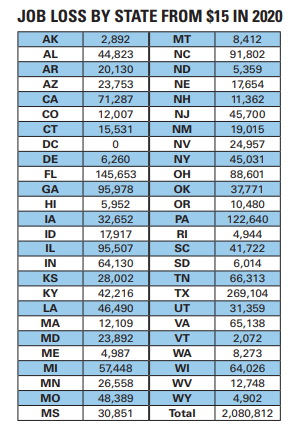 The policy brief also includes a chart that breaks down by state the projected job loss of a federal $15 minimum wage in 2020 using Congressional Budget Office methodology. View the chart here or below.